HBO's "Game of Thrones" (and "Westworld") didn't make the trip to Comic-Con this year, nor did Marvel Studios or Disney for its big budget movies. Starz will take its hit "Outlander" to New York Comic-Con this October (4-7), but skipped San Diego Comic-Con. Zachary Levi's Nerd HQ didn't return as speculated, but that doesn't mean there wasn't fun for fans at San Diego Comic-Con, thanks to SyFy, FX, Laika and AMC. According to Theresa Beyer, AMC's head of brand activations, "What fans really love to do is put themselves in the show" and planning begins 3-4 months before SDCC. At the Dead Quarters, that meant "iconic" scenes from this past season are "re-created in a very authentic way." In "Fear of the Walking Dead," Alicia and Naomi were forced to escape on a water slide but at the activation, due to safety concerns the activation's 22-foot slide ends in a crash pit filled with reddish foam cubes and a few walkers threatening participants. There are also little CGI magic photo ops with Jadis' walker composter and Negan’s flaming Lucille. Beyer explained that after Jadis' community had turned into walkers, "as an act of compassion, she (Jadis) puts them through a grinder." The gunk and goo was supplied via CGI magic. In the recreated safe house, you could get your photo taken with Lucille, a flaming bat. Fans could take photos of Daryl Dixon's actual motorcycle. The cast members from both shows were on Hall H panels on Friday and some cast members dropped by the activation by late Saturday afternoon. While fans had to keep hands off the cast and the bike, there were hands-on moments with martial arts demos led by Steven Ho, the stunt coordinator for "The Walking Dead" who trained several of the actors for the series. AMC found other ways to bring Walking Dead fans together at and beyond SDCC. Clayton Neuman, vice president of games and applications at AMC, and Joonas Virtanen, Marketing Director of Next Games, demonstrated the new mobile game: "The Walking Dead: Our World." Using data from Google Maps and a little augmented reality, Walking Dead fans go on missions to transport survivors to safe houses. The game, Neuman explained, brings "the zombie apocalypse to the real world" and answers the question: What would you do during a zombie apocalypse? Virtanen noted, "What you see around us is what you see here. If you move, you move in the game." Instead of playing a character, you are "always playing yourself, but you can choose a companion to fight these battles with you." That includes series characters both living and dead (like my husband's favorite, Glenn). Fans can join forces to go on missions and even bring in fans from other areas into their mission. Learning from the hazards of Pokemon Go, the game limits how far ahead you can see and allows you to report areas where the game might not be appropriate. Instead of looking back, FX generally looks forward obliquely. Last year's FX (Fox Extended) activations seemed to be themed on a rundown carnival. This year's FXhibition on the Hilton Bayfront was themed on art exhibition. 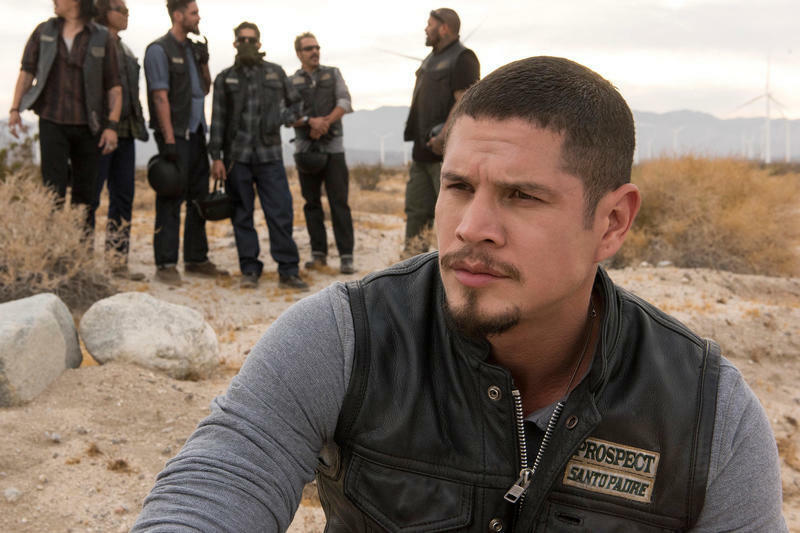 To introduce, "Mayans M.C.," the new series from Kurt Sutter ("Sons of Anarchy"), there was a "Deconstructed Bike Zone" with a deconstructed motorcycle photo-op and visual interpretations by artists including El Mac, David Flores and Oscar Magallanes. For the animated feature, "Archer," people could literally get inside the heads of the characters by standing up inside suspended sound boxes adorned with character art and listening to classic sound bites from the show. Think Andy Warhol pop art with a TV twist. You could also get an FX 3D Me, the ultimate selfie that uses a 360-degree scanner to take picture of you from all angles and places you in a scene from your favorite show. According to Arianne Antonio, FX commissioned Marco Brambilla Studio to make an art installation by providing images and then giving artistic freedom. The result was "The Legion Chamber" that puts you inside the digital realm of David Haller. Haller ("Downton Abbey'"s Dan Stevens) is an X-Men mutant diagnosed with schizophrenia. In the comics, the character had dissociative identity disorder with each of his alternate personas controls a portion of his superpowers. In the TV series, the character possesses psychic abilities but has a fractured view of reality and is considered an unreliable narrator. The visual installation is like a nightmare filtered through a kaleidoscope—you might not even notice images from the series while watching the beautiful shapes and colors shifting. Last year, the "American Horror Story" activation was a zoetrope of horrific clowns—coulrophobia with 3D color models. This year, the AHS was an "Eccentricities Gallery" featuring odd objects of art that would transform into scary things when viewed through Augmented Reality software installed on tablets. Each guest of the gallery was carefully monitored by white lab-coat clad docents who guided one through. A sculpture of a fallen woman covered by a sheet comes to life. The statue reduced to only a human torso suddenly becomes the home of hornets who then attack the guest. Bird cages made of bones start to fall apart and human teeth rain down and collect on the floor. A book comes to life with a clawed appendage reaching out. The odd cool calm of this gallery experience is set to unsettle. Laika Live offered a more serene museum experience with sets from "Coraline" and "Kubo and the Two Strings" as well as a behind the scenes look at the stop-motion puppets and explanations about the animation. Of course, there's also a preview of the upcoming Laika movie (April 19, 2019 release), "Missing Link," and a chance for a selfie with the titular character as well as a Laika-themed gift shop. The pop-up installation this year was three times the size of last year's installation. 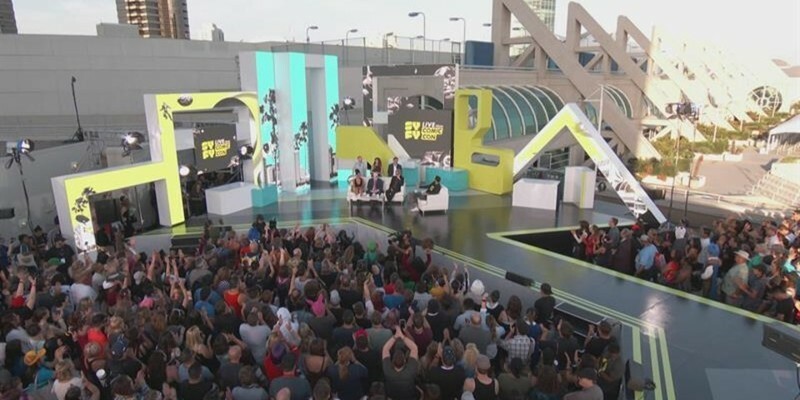 Fans of Zachary Levi and his Nerd HQ dance parties weren't disappointed because Levi hosted "Syfy Live from Comic-Con," a three-night live TV event Thursday through Saturday. Of course, Nerd HQ frequent flyer and Con favorite, Nathan Fillion also wasn't absent from SDCC; he's the lead in a new series—ABC's "The Rookie" and was at SDCC for signings. Last year, Insight Editions launched its Ninja Turtles Pizza Cookbook with a special pizza party, featuring some pizzas specially made, coming straight off the menu. Local restaurants and bars similarly celebrated SDCC by featuring food and drinks for fans of the Marvel-verse, DC Comics, video games and more. Fans of the new "Lost in Space" series, could find Robo Romance in some picturesque locations at the Nerdist House (Sparks Gallery) where you could also hear live Nerdist shows, in-depth interviews and conversations with people such as Leonard Maltin and Jessie Maltin ("Maltin on Movies"). You could test your emergency skills and repair a space escape pod in a VR experience based on the sci-fi series "Sona," created by Ashley Clements ("The Lizzie Bennet Diaries"). I was deemed emergency ready, successfully completing all the tasks and have a medal to show for it. Some Netflix "Lost in Space" cast members were at the Legendary Television's Lost in Space Robo Rhythm party at Oxford Social Club that also featured drinks named in honor of the series like "Danger, Will Robinson (vodka spiked Shirley Temple), "The Don West" ("smuggled" whiskey sour) and "The Nerdist Is My Co-Pilot (Gin Aviation Cocktail). Ignacio Serricchio, who plays the rascally Don West, was there and reminded me that he was Argentinian when he saw me dancing tango (but alas, he did not ask me to dance). Some of the smaller networks and shows try harder. One of my favorite experiences from the past was the panel for History's "Vikings." I hadn't seen the show, but I enjoyed the chemistry of the panel members and the love the cast showed to their fans, taking as much time as possible for selfies with their legion of fans. This year's "Vikings" panel was Friday morning in the larger, more prestigious Ballroom 20 and that meant little chance for fan selfies and no swag. Last year and this year, a lucky few got into a small, intimate party Syfy held for its "Stargate" fans, featuring some props and a photo booth. When I attended last year, fans could mingle with some of the panel members or just geek out with other "Stargate" gazers. Syfy made a big impression on the crowds inside and out of the convention center. Their black and neon green mystery boxes intrigued fans in the verge of a freebie frenzy because when you see someone with something you might want, you ask. Syfy sponsored karaoke buses, including one with cast members from "Krypton," bingo buses and the human claw. Based at the New Children's Museum, Syfy made everyone who waited through the lines winners; the boxes contained a Funko figure and smaller item and a t-shirt. The human claw lifted the helmeted participant in a harness slowly up and then across and over a shallow pit filled with foam cubes and the plethora of mystery boxes. Working in a harness like some actors and stunt people do isn't as easy as it looks! The one of the sweetest outreach to fans was from Marty Krofft. Sid and Marty Krofft were to headline a Saturday panel, about the past and what the legendary TV icons hoped to do in the future, but Sid couldn't make it due to an injury (He was "present" in a video) and the original moderator got a last-minute movie gig. Marty gave out exclusive posters and signed each one (over a hundred) after the panel. Sometimes even disappointment can be turned into a fan-tastic experience at SDCC. The best experiences at SDCC aren't necessarily in Hall H or Ballroom 20 and you don't need a pass to have fun.